Newcastle is to build a flagship two-way protected cycleway in the city centre. The cycleway will extend from the Civic Centre and run along the full length of John Dobson Street, some of which will be closed to cars. Traffic will now be transferred to single lanes and the area willl benefit from pedestrianisation at a cost of £1.1 million. The route will also link up with the 725 national cycle network providing links between Blyth and Darlington. 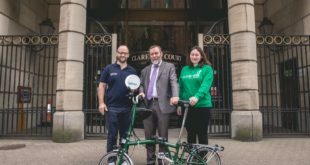 Funds are to be delivered from the City’s Cycle Ambition Fund. Work could begin by summer and will take about a year to complete. The plans for the new cycleway were okayed by the Cycling Stakeholder’s Group. The Newcycling campaign group is not part of the Cycling Stakeholder’s Group. With £10.5 million in the bank set aside for other cycling schemes, Newcastle looks set to follow London’s lead in creating safe cycling routes, with further plans outlined between Science Central and Arthur’s Hill, as well as a proposed £2.5m link between Ouseburn, Heaton and Jesmond and a fully upgraded Coast Road route. For more on the plans, see Chroncilelive.